Task Manager is a brand new browser add-on for the Firefox web browser that adds task manager like capabilities to the Firefox browser. One of the cooler things of Google Chrome is the Task Manager that Google ships with the browser natively. Chrome’s Task Manager displays all open websites in tabs, internal processes, and extensions, and lists their memory, cpu and network use. You may use it to end any process right from there, which can be mighty helpful if a website or extension is misbehaving in one way or another. To open the Task Manager in Chrome, simply use the keyboard shortcut Shift-Esc, or click on Menu > More Tools > Task Manager instead. The new Firefox add-on Task Manager works similarly. You need to install it first in Firefox though as it is a third-party add-on and not natively integrated in the browser. The extension adds an icon to the main Firefox toolbar that you may click on to display the tasks in the browser. Note: The author states that the extension works best if you have multi-process Firefox enabled. This test was done on a machine running Firefox with e10s and eight content processes enabled. The Task Manager interface for Firefox opens in a new window when you click on it. 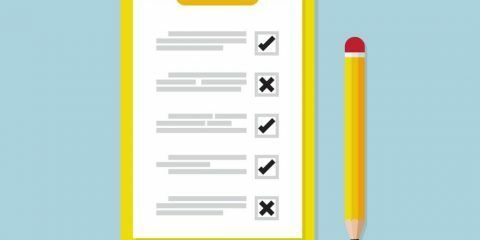 The information it displays list the type of task (e.g. web page or add-on), a description which usually is a name or title, memory use, process ID and information, cpu and system utilization and P.Memory. 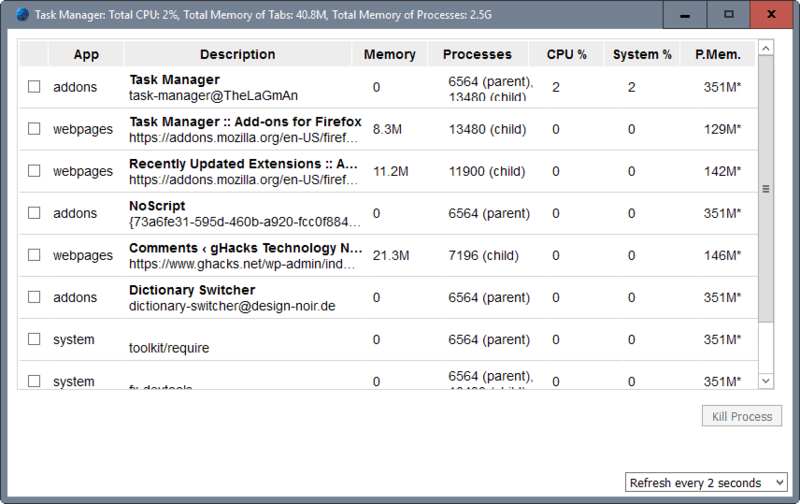 You may notice that memory is not listed for some tasks (usually not for add-ons or system). A click on a task displays additional information about it in the lower pane. This includes its full url, if available, and various memory related information. The extension refreshes the listing every 2 seconds by default which you can increase up to 10 seconds or decrease to 1 second. It would be handy if there was an option to pause the refreshing. Just like Chrome’s Task Manager, Task Manager for Firefox allows you to kill processes. All you need to do is select one or multiple processes — there are checkboxes for that in the front of each line — and click on the kill process button afterwards. Please note that the ending of processes is limited to web pages currently. The “kill process” button remains inactive if you select system or add-on tasks in the listing. A killed website is terminated immediately. This means that its tab is closed, and if it was the last tab of a window, that window enters Valhalla with it. Mozilla incidentally is working on a feature to display the memory use of individual content processes as well in Firefox. Task Manager offers an advanced interface however and options to kill processes, something that Mozilla’s current implementation does not support. All in all, another shining example of how powerful Firefox’s add-on engine is currently. Now You: Do you monitor memory use of your browsers? The post Firefox Task Manager extension appeared first on gHacks Technology News. Which Browsers Should Your Website Support?